A while ago I purchased three NYX Liquid Suede lipsticks-- in colors Cherry Skies, Tea & Cookies, and Kitten Heels. Kitten Heels, a bright red shade, is by far my favorite of the three. 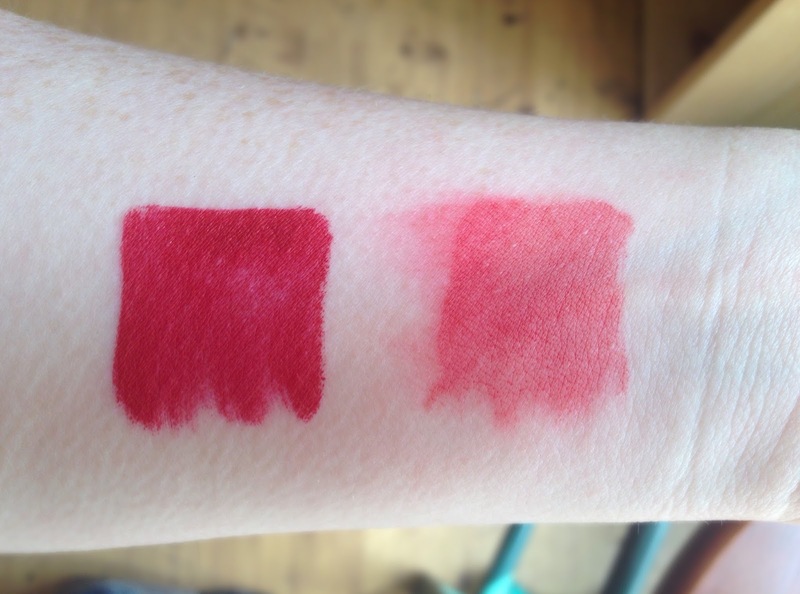 Recently I bought the liquid lipstick from Anastasia Beverly Hills in the shade American Doll, which I swatched in this post. I didn't realize at the time of purchase that Kitten Heels and American Doll are essentially the same color. So let's compare! Left: American Doll from Anastasia Beverly Hills. Right: Kitten Heels from NYX. It may be hard to tell from the photo, but American Doll is very, very slightly more pink than Kitten Heels. It is hardly noticeable. While these products are very similar in color, they differ in price. 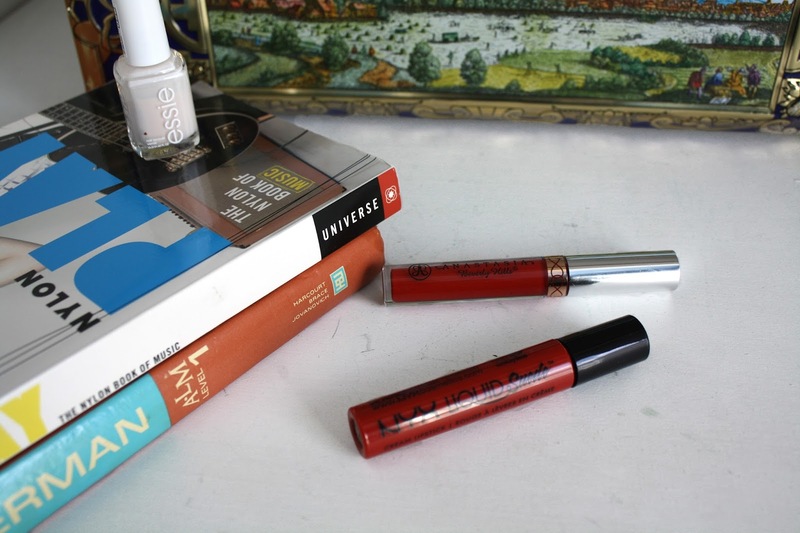 The Anastasia Beverly Hills liquid lipstick is $20 while the NYX Liquid Suede lipstick is $7. Ignore my goosebumps, but as you can see, when I tried to wash the swatches off American Doll stayed on much better than Kitten Heels. Let's see how well they last through the day without reapplying. DAY ONE: I decided to do my first test with the Anastasia Beverly hills. This was the first time I ever put it on. My first impression was very good, it went on easily and felt light and velvety smooth, and there was no patchiness in color. 2 hours later and after sipping iced coffee through a straw and eating a piece of avocado toast, it had worn off a bit around the interior of my lips, as I expected it would. By the end of the day my lips felt a little dry and the color looked a little patchy. Considering that I ate 3 meals and drank a lot today, it stayed on pretty well. DAY TWO: I've used the NYX before, but I paid more attention to it this time. It was slightly more difficult to apply and I noticed it didn't dry as quickly as the Anastasia. No patchiness in color. After eating breakfast and lunch and it had faded a lot around the interior of my upper lip. After eating 3 meals, it had faded quite a bit. It looked like I had very sloppy lip liner on. It felt a little clumpy on my lips, too. My lips didn't feel as dry as when I wore the Anastasia. I'll be honest, I was rooting for the NYX liquid lipstick to be the winner because it's less expensive, but I prefer the Anastastia Beverly Hills liquid lipstick. It lasted longer and proved to be more waterproof, and didn't get clumpy like the NYX did. If I had reapplied, I probably only would have had to do so once, while I probably would have had to reapply the NYX liquid lipstick twice. Really, they are both great products for the prices and they come in great colors. 2 comments on "Battle of the liquid lipsticks"
This is such a helpful post! There are so many dupes when it comes to colour selection with liquid lipsticks but it seems that it's worth it to splash out on the more expensive ones for the longevity of the product :) Love this shade of red on you btw!